U.S. Mail Supply is North Carolina’s premier distributor of secure steel & aluminum constructed USPS approved & private delivery mailboxes. American-made and built to endure years of heavy use, our locking mail boxes are ideal for multi-unit buildings like apartments, condos, offices and multi-family homes. Your business needs a professional look as well as security features to give you peace of mind. Shop small or large indoor horizontal/vertical lockable mailboxes and outdoor pedestal mail boxes – ranging from purely functional high volume mailboxes to high-end, luxury styles. American-made Florence 4C horizontal mailboxes are a perfect choice for apartment owners looking for a secure, wall mounted or recessed option for a lobby. 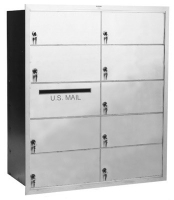 In addition to USPS Approved units, we also have outdoor 4C pedestal mailboxes for private use only. The postal service has policies and regulations on the type of mailboxes they will deliver to. U.S. Mail Supply offers an impressive selection of USPS approved indoor & outdoor mailboxes to ensure all that’s left for you to deal with is the installation. Shop all different styles of mailboxes for apartments: vintage, luxury, Victorian, and modern style outdoor mail boxes or indoor wall mounted mailboxes. You can even customize your mailbox with a compartment for packages. Shop individual pedestal mailboxes or order large mailboxe structures to provide secure mail storage for tenants or employees. Decorative pedestal mail boxes are an elegant solution for luxury and high end apartment complexes. U.S. Mail Supply offers a variety of horizontal & vertical indoor mail boxes for commercial applications. Provide an easy and secure lockable mail solution for your office employees, staff or tenants. Customization options available. For single unit residences, U.S. Mail Supply offers post mounted residential mailboxes or wall mounted mail houses. 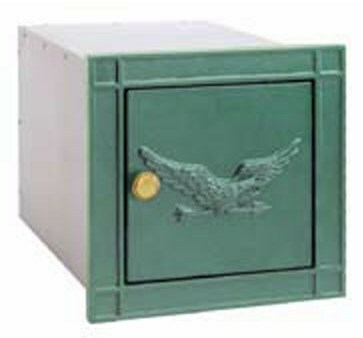 Choose pedestal mounted residential mailboxes or individual decorative residential mailboxes. 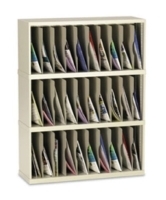 Shop open and closed back mail sorters for mailrooms, offices, classrooms or home use. We’ve got small and large mail sorters in many different dimensions and slot counts. Choose security mail sorters for HIPPA compliance. Shop durable metal mailboxes - and skip the cheap ones. The greatest feature of mailboxes supplied by U.S. Mail Supply is their tough steel & aluminum construction - these mailboxes stand up to wear and tear, as well as harsh weather. There's no sense in pinching pennies by buying a mailbox that will only last a few years before you're back shopping again. Our residential & commercial mailboxes are built tough to last and provide security against vandalism. We’ll help you come up with the perfect solution and quote you the lowest price.